We’re supposed to throw out makeup once they’ve been on our dressers a little too long, whether we’ve used them up already or not. It seems like such a waste, but apparently, if we keep makeup for too long, it’ll be crawling with bacteria sooner or later. So into the bin they should go. If you’re feeling a bit guilty about cluttering up the landfills with your used makeup, the Appalachian Wildlife Refuge has a good idea how you can put your makeup, specifically your mascara, to better use. 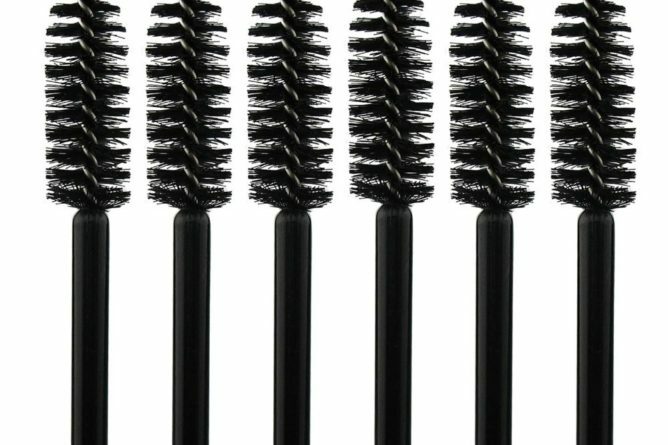 To support the effort they’ve dubbed Wands for Wildlife, they’re encouraging people to save and wash their old mascara wands and send it to them. They use the mascara wands to brush away fly eggs and larva from the fur of the animals they rescue, grooming them back to health. Check out the video below to see how they use your old mascara wands, and find out how you can help out on the Appalachian Wildlife Refuge’s Wands for Wildlife page! If you’ve ever wondered what happens to the soap that you didn’t fully use up and left behind in your hotel bathroom, you’re not alone. 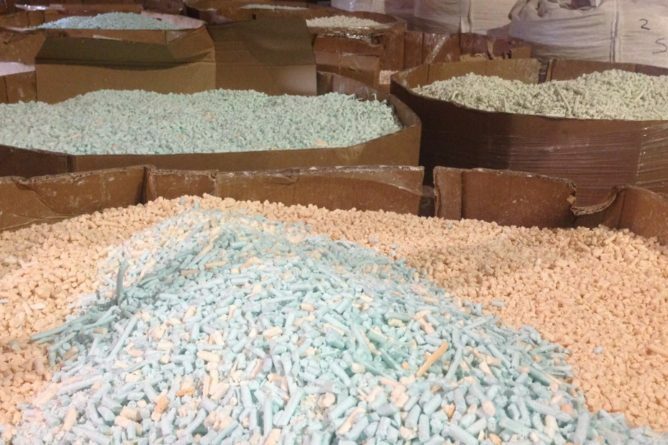 The same issue crossed the mind of Shawn Seipler, so while staying at a hotel, he decided to ask about the fate of leftover soap bars in hotel bathrooms and learned that they just get thrown away. Upon learning this, Shawn did his research and found that there was another way to save all that soap and keep them from being wasted: through rebatching, which involves melting down old soap and then reforming it into new soap. And thus, Clean the World was born. The organization works with approximately 5,000 hotels, who pay them 50 cents per room to gather and recycle the leftover soap. The soap rebatching process is done in Clean the World’s plants in Orlando, Las Vegas, Hong Kong, Montreal, and India, and the soaps are packed into hygiene kits that are then distributed throughout the world. Essentially, Clean the World’s goal is to help promote proper hygiene and the implementation of a sound sanitation program to help eliminate diseases caused by poor hygiene, effectively having a hand in saving lives. While Clean the World doesn’t accept soap donations from individuals and small groups, anybody can participate in their efforts in different way. They welcome financial support to help them keep their recycling efforts going, and they also encourage people to undertake their own projects to create hygiene kits and donate them to shelters. Learn more about their lifesaving work at the Clean the World website. The concept of Ecobricks has been around for a while, but hey, this blog has been silent for sometime, so we simply have to talk about it now. I’m hearing about a lot more people joining in and making their own Ecobricks at home nowadays, which is great. 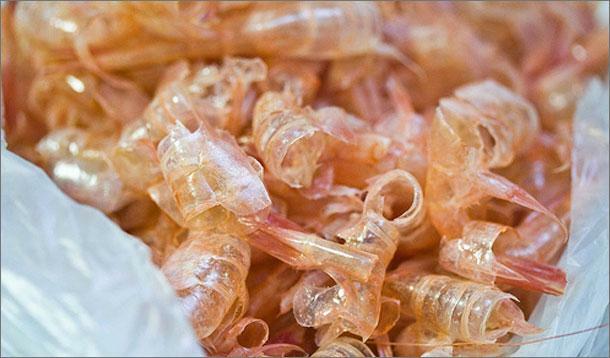 If you haven’t heard about them yet, simply put, they’re plastic bottles stuffed with non-biological waste, and they can be used to make modular furniture and even buildings. Last year, the #StuffItChallenge was launched in the Philippines to encourage more people to make Ecobricks, setting designated dropoff points for the bricks, which will be used for low-cost housing in various communities. 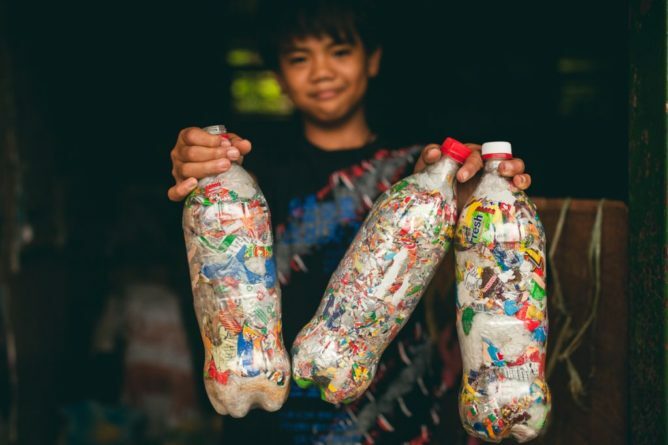 Ecobricks can be connected using silicone, cement, and other materials, and they’ve been used to build or fortify various structures throughout the world already, such as a clay bottle house owned by Jane Liwan, a utility worker at the Besao District Hospital, in Besao in the Northern Philippines, and a classroom in South Africa. Currently, the Ocean Ecobrick is being developed, which can be used for outdoor and even floating constructions on the water. Making an Ecobrick is extremely simple, and it’s definitely a good way to eliminate plastic waste and encourage creativity when it comes to building structures, too. Researchers at Harvard’s Wyss Institute for Biologically Inspired Engineering hit upon the same solution a few years ago and found that material made from chitosan breaks down weeks after disposal and can even provide nutrients for plants. 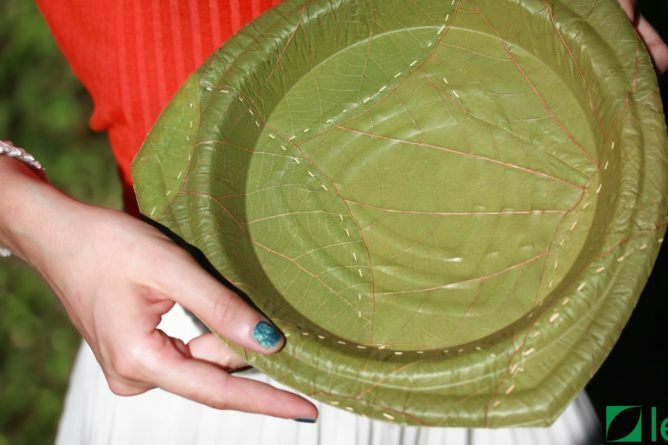 Making plates out of leaves has been practiced in India for centuries, and eating on banana leaves is not unheard of in other countries, such as the Philippines as well. German company Leaf Republic has taken the concept and taking it to the rest of the world too with their disposable leaf plates. The plates are a fully funded Kickstarter project and they were shipped out to customers beginning in January 2017. They’re made from leaves of a creeper that grows wild in Asia and Southern America, which are sourced directly from local villagers. They also stay green after being pressed, too, and the plates are waterproof. Some people have asked if they can be reused; according to Leaf Republic’s Kickstarter FAQ, the plates can last for weeks if used for dry food, but cleaning them is difficult, and hot water would compromise the stability of the plates. They’re also biodegradable and have a life span of 28 days, but only if you put them in your compost heap–they won’t fall apart if they’re just stored in your cabinets. They’re definitely much more attractive and interesting than your usual paper plates and would be an eyecatching choice for your next party, and they’re also great for use during camping. Leaf Republic ships all over the world. Hickman’s Family Farms, an egg producer in Buckeye, Arizona, has made the switch to egg cartons made from 100% recycled PET from water and soda bottles thanks to the help of California-based recycler Global Plastics Inc. The company recycles four million bottles a day, and one of the issues to which it needed to find a solution was what to do with the green and amber bottles that they pick up for recycling. And that’s where the idea for a recycled egg carton was hatched. 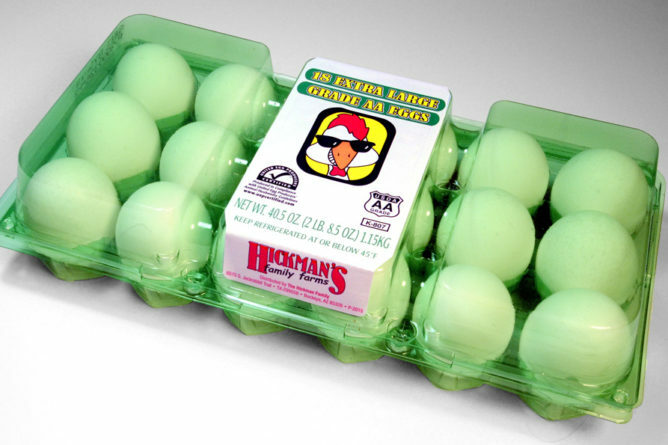 Dan Bahou, whose father started Global Plastics, pitched the idea to Hickman’s, who were receptive to the concept of the egg carton. Five bottles are needed to make an 18-count egg container, and a 12-count egg container can be made from three bottles, with a 24-egg carton on the way, too. Aside from being eco-friendly, the carton is also carefully designed to reduce egg breakage and to ensure convenience for customers. Working with a packaging designer, along with Billy Hickman and his brother Glenn from Hickman’s, Bahou developed the 100% post-consumer RPET egg carton. The innovative design for the egg carton includes “lock-in” support pillars that offer protection for the eggs by allowing them to be fully beneath the lid of the package. Additionally, the bottom of the egg rests in a perfectly formed raised indentation for added protection. Additionally, the transparent package eliminates the need for the customer to open the carton to inspect the eggs. These features have reduced egg breakage as well as damaged packaging. Read more. Given that Hickman’s is able to break, pasteurize, and package 100,000 eggs per hour, and that they donate truckloads of eggs to food banks throughout the state and even to Korea, they’re definitely bound to use their new egg cartons quite a lot and help save the planet in the process. Mobile phones contain metals such as gold. In fact, you can get 1 g of gold from 35 phones, which doesn’t sound like a lot, but not when you consider how many mobile phones are out there. 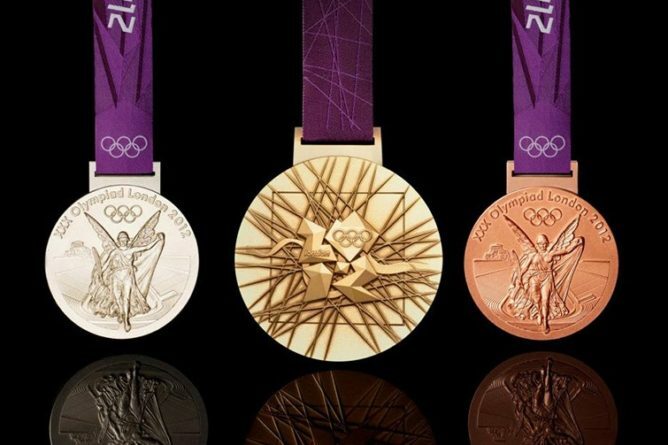 The organizers of the Olympics in Tokyo, Japan, have sent out the call to people to donate their mobile phones and hopefully come up with 8 tonnes of metal–or 40 kilograms of gold, 4,290 kg of silver ,and 2,944 kg of bronze–with which to make the 5,000 medals for the Tokyo 2020 Olympics and the Paralympics. Apart from promoting sustainability, another goal is to help the citizens be more directly involved in the event. A recycling bin created by students from a Tokyo Metropolitan Government-run industrial high school has been set up at the Tokyo Metropolitan Government headquarters, and collection has already begun. It will end once the 8 tonne goal has been reached. My mother and I went on a quick trip to Antipolo City the other day to buy the usual goodies: suman, kalamay, and cashew nuts. 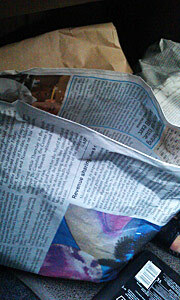 To our surprise, the seller wrapped our purchases in old newspaper pages. It looks like the city really is taking its plastic bag ban seriously, so well done, Antipolo. Earlier today, I headed over to Santis Deli for some cheese and phyllo. It’s been about a couple of months since I was last there, so I was happy to see that they’ve done away with their plastic bags and are using paper bags instead, although they encourage people to bring their own bags. I think it’s pretty amazing how more and more supermarkets here are encouraging people to bring their own shopping bags, when just a few years ago, the idea wasn’t very popular. Some places are charging for plastic bags as well, and many are selling their own branded reusable bags. Now if only more people would actually start using reusable bags.